Get Active & Get Informed! The Prosthetic Users Group meets the second Tuesday of the month, from 6:30 pm – 8 pm. The meeting locations will change. but it will always be the second Tuesday at 6:30 pm. Check this page for meeting location. Agenda: Discuss Upcoming Events! We have many events this spring. Read below for detail! Congratulations to Mitch Forrester! 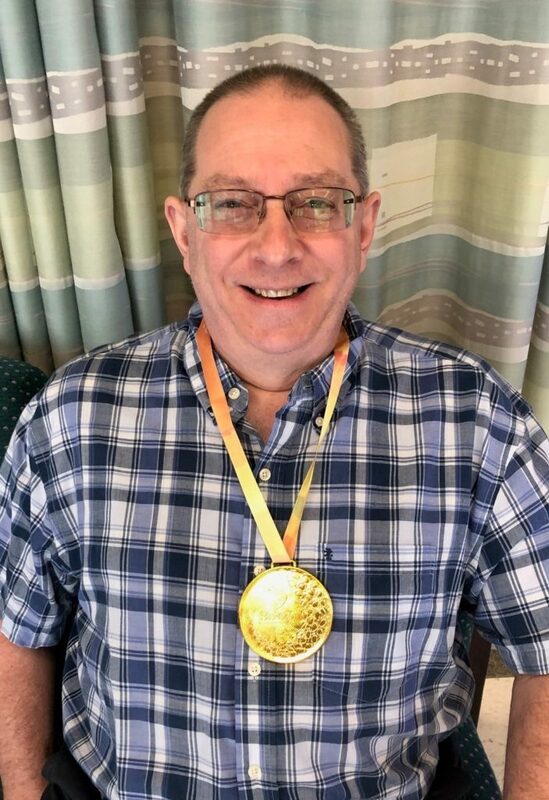 He met his goal and got the gold medal for April! He mowed the lawn again. Woo Hoo! Way to go Mitch!! 3rd Annual Event is fun for all! 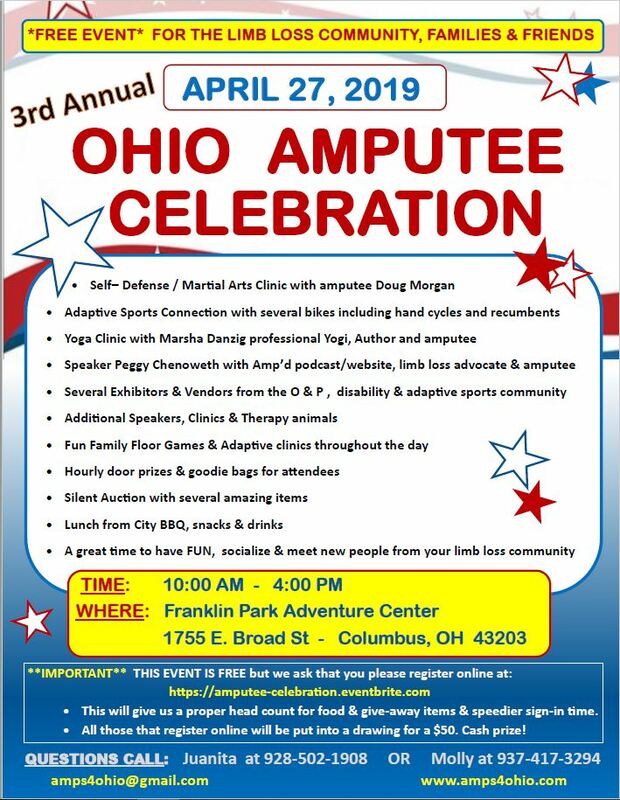 Meet amputees from all over Ohio and outlying areas. Exhibitors/Vendors, Adaptive Bikes, Speakers, Adaptive Clinics & Equipment, Floor games, BBQ lunch, snacks, gift bags, door prizes & more! Parkersburg Country Club, 4910 1st Ave, Vienna, WV 26105. 1pm-3pm Therapists assist Amputees to learn to Golf! 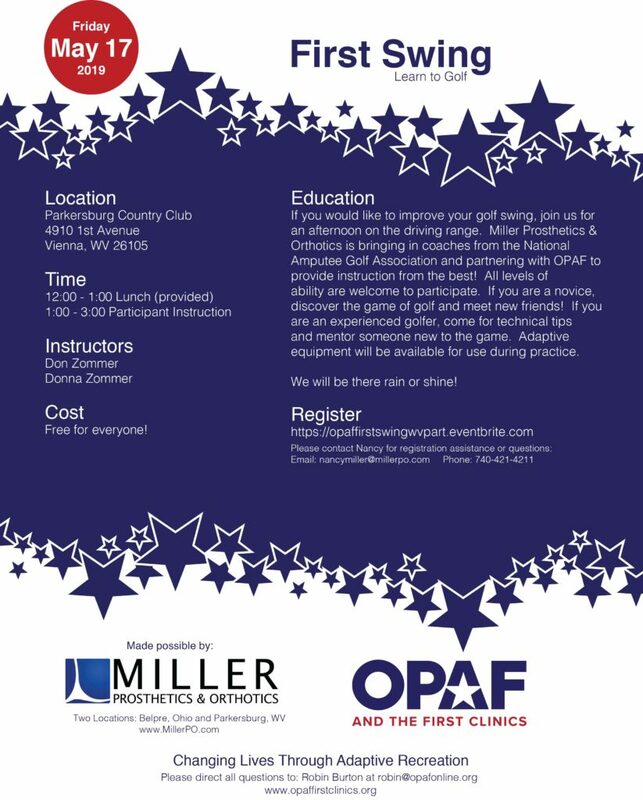 Miller Prosthetics & Orthotics is excited to sponsor an opportunity for you to learn about adaptive golf, techniques and equipment. This free event is coordinated by the National OPAF organization with expertise instruction from Don and Donna Zommer from the National Amputee Golf Association (NAGA) Therapists and PGA Golf Professionals can apply for CEU’s (Continuing Education Units). Our Monthly Meetings are Free to attend! We invite new and experienced amputees, family and friends or those who may be scheduled for surgery or making important life decisions to share information, learn the latest technologies and adapt and overcome challenges together. We hope to integrate additional activities and outings. Our local group is also a member of the Amputee Coalition, which is the leading national organization working to ensure that amputees do not go through their journey alone. They are promoting April as National Limb Loss Awareness Month, and have numerous ways for you to get involved. Join the Facebook Group to keep up to date with current activities and to post pictures and let us know what’s going on with you!